When a young creative woman was inspired by the famous Fearless Girl statue, she decided that fearlessness was exactly what she needed to get her foot in the door of adland. Here's Jade Delaney's diary of that day. I’m sitting on my bed; my best friend Dan is there and I’m talking about how rubbish my day was and then I tell them I’ve got a plan that might change everything. I know I have enough talent to make it big in this industry, but you get setbacks. Things don’t always work out and you start to lose confidence in yourself. I’ve heard creative professionals tell me, if you want to make it in advertising you must be resilient. Now I know what it means. If you work hard and you have grit you can make it. 10am: Dan arrives with a couple of coffee fraps, buzzing for the day ahead. I say to him "It’s actually happening, today is the day". 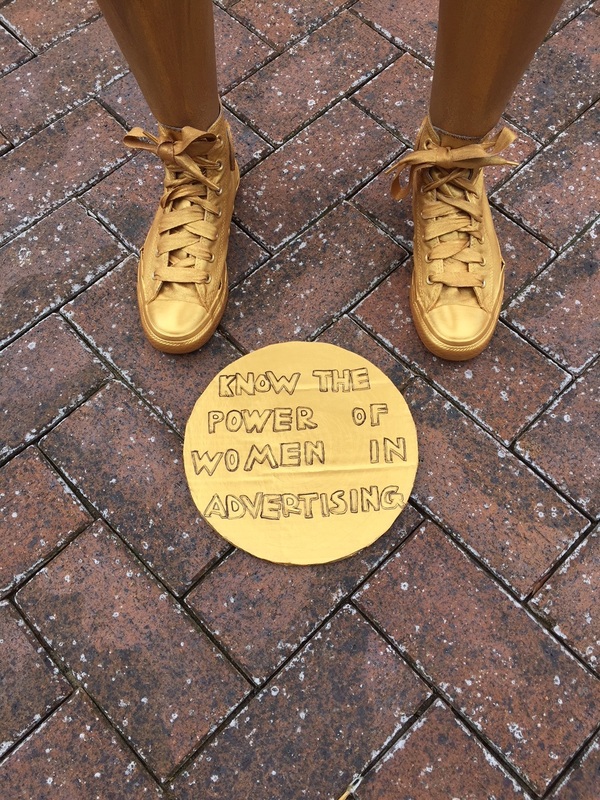 It’s official, today I’m a statue and the nerves are starting to kick in. 10.30am: Make-up artist Shari Knowles has arrived to do my gold body paint. As soon as she starts painting with the cold gold makeup I say: "There’s no going back." She says: "You can’t turn around now and do it tomorrow instead." Every now and then I catch a glimpse of myself in the mirror, and almost don’t recognise myself. It’s weird seeing yourself gold, it feels tight on the skin, and you don’t want to smile to much in case it cracks the paint on your face. I feel like I’ve got my war paint on. When the outfit is complete and I’m all dressed and ready to go, I think, am I mad for doing this? But any moments of doubt I focus on the reason why I started on this journey. 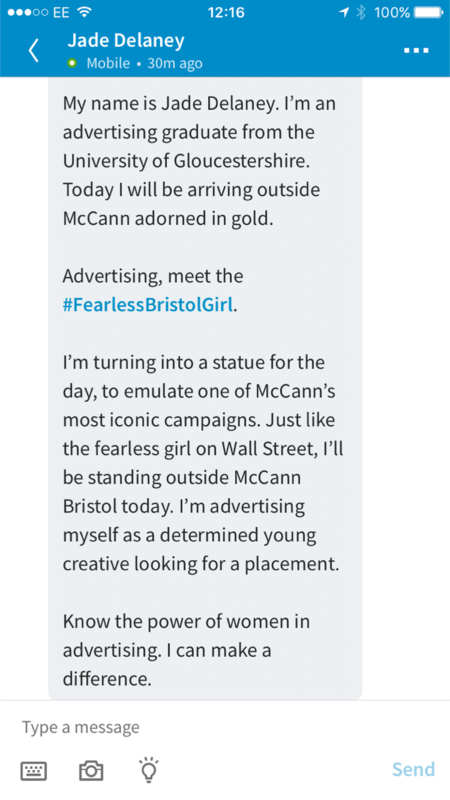 11.30am: I just sent a message on LinkedIn to McCann Bristol’s managing director Andy Reid and creative director Jon Elsom to let them know that I will be outside the building in half an hour to show them my take on Fearless Girl. Shari is giving us a lift to the McCann Bristol office, so that we don’t have to take the bus covered in gold paint! I’m having fun chatting and laughing on the way down, trying to distract myself from over-thinking what might happen. I am staying mindful. 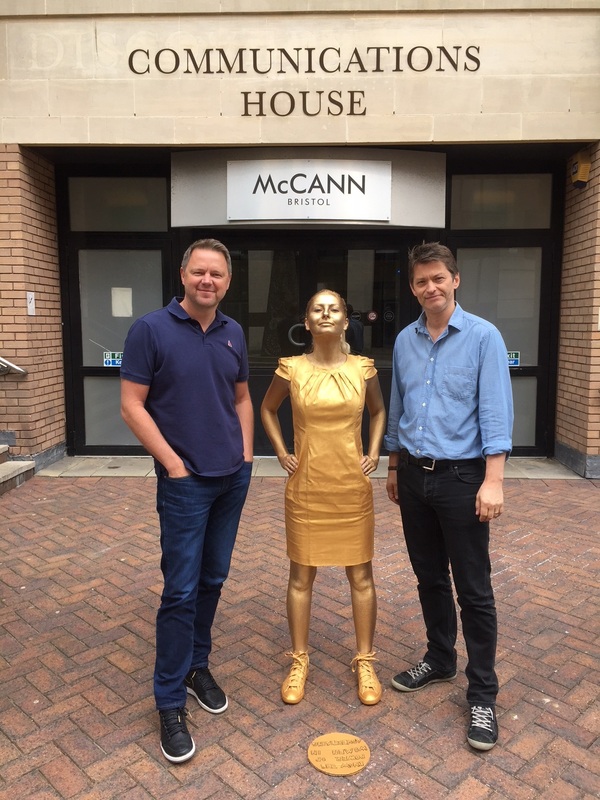 12pm: I’ve arrived at the McCann Bristol office, along with my friend Dan who was helping to take pictures and post on social media. I can’t believe that I’m finally doing what I’ve been telling my friends and family I would do for months. I want to aim for lunchtime to catch as many people as possible, so pose outside of the office from around midday. I joke with Dan, saying: "What if they don’t get it and no one comes out to speak to me?" The sun is shining, and it starts to get a bit busier. People are coming up to me asking questions, reading the plaque and asking if they can take photos. 12.15pm: Andy Reid and Jon Elsom have come out to speak with me. They’ve asked me why I’m doing this and what I hope to achieve. I say: "I want a placement." I’m so ecstatic. They just said: "Of course, we can sort that out for you." Everything that could have possibly gone right did. I’m so happy that they like my stunt. People keep saying to me it’s pretty ballsy to go and do something like this. I think it is hard to stand out from the crowd but sometimes you must go big or go home. This stunt symbolises how determined I am to have a career in advertising. It means so much to me to know I’m doing the right thing and to be given a chance. 12.30pm: Andy and Jon go back inside the office, but I stay around for another hour. People are asking me what I’m doing, they are really inquisitive. Everyone is supportive and wishing me luck. A few women tell me that "we need more women like you doing things like this". At just the right moment, someone brings me out a cup of tea from the office; the sun is gone and the wind is whirling. Some doors in life don’t open until you kick them down. I’m a fighter and the most fearless girl I know. Why not give it a try, what’s the worst that could happen? People might think you’re a bit mad but think about what’s the best that could happen? I start my placement on Monday morning. 1.30pm: It’s getting a bit cold, so I decide to call it a day and head off for lunch. I walk through town to Nandos and enjoy a feast with my best friend. Overall, I’m really glad that I did it and I made everyone’s grey Wednesday a little bit brighter with gold. It’s so much fun getting dressed up, not knowing how people would react is part of the excitement. But I didn’t expect such positive feedback. I head home on the bus still dressed in gold. 9pm: The sun has set and I’m home contemplating the events of today. I tell my mum everything and she’s so excited. Mum tells me how proud she is of me with tears in her eyes and said she won’t be able to sleep from all the excitement of today. She tells me: "I knew it would work, from the moment you told me, I just knew it." I’m here sitting in my living room, watching Twitter blow up. New York Stock Exchange retweets McCann’s post of me as the Fearless Girl to their 1.56 million followers. And I still can’t take it all in. I’m going to sleep well tonight. Today I made my dream a reality, I’ve got my foot in the door. I hope that I can show other prospective female creatives that they can do it too. There’s no time like the present. Be fearless, you never know what might happen.